THE recent pick-up in residential sites acquired by Singapore developers suggests that they have finally come around to the prospect of a more decisive recovery in Singapore’s residential market, and the downside of a depleting landbank. Despite earlier concerns of gung-ho foreign developers crowding out local developers for residential sites sold by the government, Singapore developers are coming out in force in the collective-sale market and other private land deals. So far, local developers make up seven of the top 10 developers with the largest residential landbank and leftover unsold units in launched projects, based on The Business Times’ compilation across developers. Two of the top 10 developers – MCL Land and GuocoLand – are technically foreign developers by virtue of controlling shareholding, but have operated in Singapore for a long time. More than half of all residential inventory is in the hands of the top 10 developers. Among Singapore players, Sim Lian Group came out on top in terms of residential landbank in one fell swoop when it purchased a former Housing and Urban Development Company (HUDC) estate that can yield more than 2,000 residential units. Oxley Holdings also made a swift comeback to its home market this year after a flurry of overseas ventures: it snagged six residential sites comprising three sites under private treaties and three via en bloc deals; of the three en bloc deals, two were for large sites secured with consortium partners. This brings its share of the residential landbank, based on its equity share of those sites, to more than 1,200 residential units – making it third in terms of landbank and fifth in overall inventory, including unsold units in launched projects. Ong Teck Hui, JLL’s national director of research and consultancy, told BT that the earlier success of some foreign developers in securing sites under the government land sales (GLS) could have been driven by their thirst to secure market share and establish themselves, especially since they could be pure residential players. Major Singapore developers, on the other hand, are more diversified in their business and are in other real estate sectors besides residential. JLL’s analysis shows that of the eight private residential sites (excluding the Bidadari mixed-use site) sold under the GLS so far this year, half went to Singapore developers – a proportion unchanged from last year. But foreign developers (excluding local-foreign consortiums) have secured more sites this year than the last – half the eight private residential GLS sites so far – compared to two out of six sites last year and four out of nine sites the year before. In the collective sales market, which is less popular with foreign developers, Singapore developers swept six of the seven deals with a residential component; one site was snagged by MCL Land. Most other private land deals this year have also been secured by local developers. Savills Singapore research head Alan Cheong said: “Singapore developers will continue to remain aggressive in their land bidding – the reason being their need to recycle their capital and keep operations going. Oxley Holdings executive chairman and CEO Ching Chiat Kwong told BT that the group’s return to the Singapore residential market is stoked by what it sees as a market revival characterised by rising purchasing demand and diminishing housing stock. Its motivation to rejuvenate older estates into new developments fuelled its interest in en bloc sites, he said. 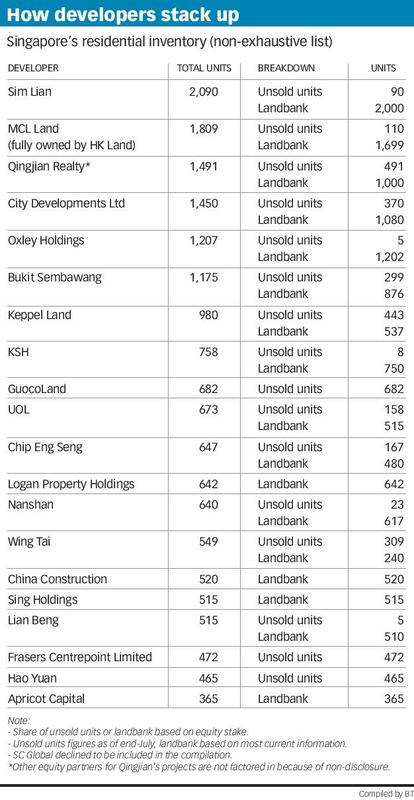 City Developments has the most residential inventory (share of unsold units and landbank) here among listed developers, followed by Oxley Holdings and Bukit Sembawang. Some large Singapore developers, which are diversified across asset classes and markets, are sitting on small residential inventory compared to their smaller peers after years of derisking their residential portfolio in response to property cooling measures. Among them, CapitaLand has signalled a more aggressive approach to residental land-banking here. Its president and group CEO Lim Ming Yan had said in a results briefing last month that the group is prepared to be “aggressive but disciplined” when tendering for residential land. CapitaLand has 197 unsold units in launched projects as of end-July. Based on official figures, unsold private residential units were at a historical low of 16,929 as of end-June, fewer than half of the 40,430 units at the last peak of Q4 2011. Going by the new sales pace of 10,336 units in the past 12 months, it may now take only 1.6 years for developers to clear the unsold stock. This is half the average pace of 3.1 years in the past 10 years. Displaced owners of en bloc sites that have been sold this year may constitute some 1,500 households looking for replacement units, and this may accelerate the paring down of developers’ unsold stock, though those looking for another unit to live in may go for the resale market, market watchers say. Knight Frank head of consultancy and research Alice Tan observed that local developers have been cautious for much longer than their foreign peers. As they step up to the plate, competition from foreign developers is unlikely to ease. “Foreign developers see increasing attractiveness of Singapore residential market, as Hong Kong and Australia apply more onerous requirements on foreign buyers. They are now on the lookout for alternative markets, so Singapore is a potential market given its long-term positive prospects in terms of price recovery,” Ms Tan said. Wang Lian, managing director of Fantasia Investment, a subsidiary of Chinese property developer Fantasia Holdings, told BT that the company is still interested in residential sites here. It is now training its eyes on high-end projects, as it sees a resurgence of demand from buyers who recognise the value of high-end homes. Fantasia is keen on both en bloc and GLS sites, and will likely participate with joint-venture partners, he added. Savill’s Mr Cheong said that foreign developers – excluding those who have operated here for much longer – tend to focus mainly on GLS sites as they are still unfamiliar with the en bloc process, and do not want to risk further market uncertainty if residents appeal to the Strata Title Board. Agreeing, executive director of research consultancy ZACD Group Nicholas Mak felt that GLS sites with attractive locations and access to transport nodes will continue to pull in aggressive bids from developers; moreover, they can take possession of GLS sites much sooner than collective sales sites, and the GLS tender process is a lot more transparent. Some market watchers believe that alternative land supply from the collective sales market and other private land deals could help to rationalise developers’ land-bidding behaviour. Maybank Kim Eng property analyst Derrick Heng believes the resurgent en bloc market could ease upwards pressure on land prices. Besides the six sites on the second-half 2017 GLS confirmed list that will add 2,800 units to inventory, another 5,000 units on the reserve list could also be triggered by developers, he estimated.